Plastic Fantastic? 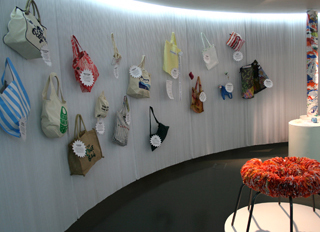 was put together for NESTA – the National Endowment for Science, Technology and the Arts – focusing on single use carrier bags and reusable alternatives. 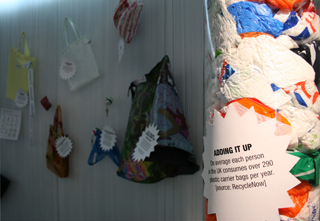 This 6-week installation in NESTA’s front of house, featuring a film and selection of products, addressed the problems with plastic and showcased fantastic alternatives from [re]design’s network of sustainable UK designers. Plastics are amazingly versatile, durable materials that enable high volume, speedy, low unit cost production. So it’s not surprising they’ve proliferated – and radically changed our world over the last century. But most plastics are made from oil, a finite resource that took millions of years to form. How can we square this huge geological timeframe, and the centuries it takes for plastics to break down, with the haphazard way we use these precious materials? Single-use plastic carrier bags, used for minutes and then discarded, have come to symbolise a lazy, throwaway culture that puts convenience before the environment. “Over time we should aim to eliminate the single-use plastic bag altogether” – Gordon Brown. Alistair Darling threatens a tax or levy on single-use plastic bags “if we have not seen sufficient progress on a voluntary basis” by 2009. Paper bags, although renewable and biodegradable, are bulky and costly to transport, consume just as much energy as plastic bags, generate 5 times more solid waste, and take 10 times as much energy to recycle. Ireland’s levy on single-use plastic bags led to a 90% reduction in use. However, use of paper bags, plastic bin liners and other bags increased. Irish government has yet to assess the levy’s overall environmental impact. 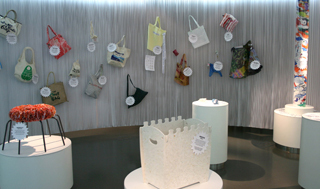 London Councils put a shopping bag bill to Parliament in November 2007 proposing a London-wide ban on single-use carrier bags in all materials. 'Banish the Bags' is the Daily Mail’s campaign to pressure government and supermarkets to reduce the number of plastic bags given out and encourage shoppers to switch to re-usable alternatives. 21 major UK Retailers issued a joint statement in February 2007 which aims for a 25% reduction in the environmental impact of carrier bags by the end of 2008. Reduction strategies include degradable single-use bags, recycled-content bags, bags for life, reusable textile bags, charging for grocery bags, reward scheme for reusing bags, bags on request and bagless tills. All bags use energy, materials and water, and release greenhouse gases and other pollution in production, transportation and disposal. The biggest cuts in those impacts are made by reducing, re-using and recycling.